The building is a form of body, which like any other consists of lineaments and matter, the one the product of thought, the other of Nature; the one requiring the mind and the power of reason, the other dependent on preparation and selection; but we realized that neither on its own would suffice without the hand of the skilled workman to fashion the material according to lineaments. Fig. 3.1. The "most perfect" O. Fig. 3.2. Mensurations of the human head. 1From a historical vantage, the Montefeltro studioli are often regarded for their display of mathesis universalis, the notion of a proportional harmony underlying all phenomena. This harmony, it was believed, could be divined through the mathematical arts, including music, astronomy, arithmetic, and geometry, and conveyed by drawings and models cast from the architect's imagination through the hand of the fabricator to frame human activities. In the studioli, this commensurability is embodied in the virtuoso marriage of intarsia and the principles of artificial perspective, developed empirically in the early 15th century by Filippo Brunelleschi and formalized by Leon Battista Alberti in De pictura.1 Although this work was conceived for the art of painting, it was the intarsiatori, rather than painters, who were first considered the maestri di prospettiva, likely due to a metaphoric kinship between the cut of the intarsist's knife across the wood and the cut of the eye across the latticed surfaces of a perspectivally harnessed space. 3By the cinquecento, however, enthusiasm for intarsia had waned. "Although it may indeed be both praiseworthy and masterly," Vasari notes, producing " . . . figures, fruit, and animals . . . most lifelike," the practice was condemned as "time thrown away in vain . . . since it is a work that soon becomes black . . . and is also of short duration because of worms and fire. "6 As further evidence of the medium's diminished status, Vasari cites the career of Benedetto da Maiano, a Florentine master who with his brother Giuliano executed much of the intarsia in the Montefeltro studioli.7 Benedetto, who is described as one of the finest intarsiatori, eventually judged the medium "a useless thing and completely abandoned it. "8 Fortuitously, then, the studioli offer the most comprehensive examples of Renaissance perspectival intarsia to have survived the subsequent centuries of despoliation, relocation, ad hoc restorations, fire, and woodworms. 4From comments made by Federico's biographers and scholars, as well as those offered by the duke himself, one might assume that the court of Urbino held the mathematical arts in preeminence to the verbal arts.9 In his patent of 1468, awarding Luciano Laurana the architectural commission for the ducal palace at Urbino, Federico famously declared: "We deem as worthy of honor and commendation men gifted with ingenuity and remarkable skills, and particularly those which have always been prized by both Ancients and Moderns, as has been the skill [virtù] of architecture, founded upon the arts of arithmetic and geometry, which are the foremost of the seven liberal arts because they depend upon exact certainty. 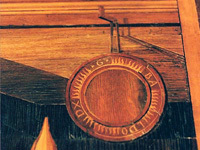 "10 Although this passage might seem to quell further doubts on the matter, we must consider a curious and telling detail: if the arts of arithmetic and geometry were perceived as preeminent to the verbal arts, why then was Guidobaldo—the young heir-apparent to Federico's dukedom—depicted in the Gubbio studiolo with the art of rhetoric and not with one of the mathematical arts? 6The third and most comprehensive response forms the basis of this study. During the Renaissance, and particularly at the court of Urbino, categorical divisions of thought and learning were more fluid and hypothetical than we might expect: the pursuit of one mode of learning was perceived not as contrary to but rather to the enrichment of another.14 While architecture, for example, represented a consummation of mathematics (as evident in Federico's patent), it served also as an educational model for memory building and oration. Consequently, the study of rhetoric was not limited to oral and verbal expression: by its architectonic precepts, rhetoric was intimately interlaced with mathematics. 7In fact, it was not unusual that a renowned mathematician such as Paul of Middleburg, who served as court astrologer for both Federico and Guidobaldo, had transcribed a treatise on rhetoric earlier in his career. Numerous contemporary works on rhetoric underscored the significance of mathematics in oratory training,15 while other ancient and popular texts presented the mathematical-linguistic relationship from a complementary angle. In Plato's Timaeus, for example, the story of Phaëthon is described as a myth that helps to explain the cyclical motions of the celestial bodies.16 Nonetheless, as history tends to alight on the unusual and overlook the commonplace, evaluations of the studioli have centered on the historical significance of the perspectival compositions and their mathematical underpinnings. 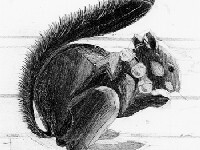 8It is probably for this reason that the mnemonic character of the studioli has not been previously addressed.17 As Peter Thornton notes, "In trying to envisage how our ancestors lived at any period, certainty is of course hard to come by and, all too often, one has to guess. Particularly difficult is to discover what people at the time took for granted, which is something they obviously do not bother to tell us. "18 For the quattrocento, memory training was deeply embedded in humanist pedagogy, not only through the recuperation of classical treatises that address this subject directly, such as those composed by Cicero and Quintilian, but also because this tradition had already been incorporated into, and transformed by, medieval practices of meditation. From ancient Greece through the Renaissance, a well-trained memory was perceived a pedagogical fundamental for reciprocity between thought and action. One did not cultivate a fine memory for its own sake, or merely as a vehicle for accurate information recall, but as the essential mental equipment for the formation of one's character. 10A further challenge to assessing the mnemonic quotient of the studioli is the practical matter that memory is not a simple subject to retrace. Like time, memory has historically proven an evocative yet evasive notion.21 As Frances Yates observes, "Memory architecture was invisible: it used buildings for its purposes, but we can never see into the actual memories in which these buildings were reflected. "22 Although manuals and pedagogical diagrams instructed the novice on various procedures for memory training, they scarcely hint at the most vital part of the exercise, mnemonic invention, characterized by fluid, even improbable associations. 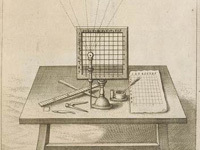 Images (described and illustrated) in memory treatises like Publicius's provided rudimentary "staples" for visualization exercises. Advanced memory work consisted in fabricating personalized images, culled from one's experience and arranged in the imagination as a mental theater of memory prompts for the mind's eye. 11 Fig. 3.4. 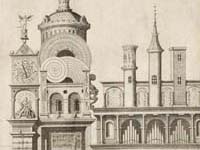 A musical memory palace.Having reached their zenith in popularity in the 16th and 17th centuries, the arts of memory gradually faded from common practice. Subsequently, a prodigious memory has been regarded more often as an anomaly to be displayed at a sideshow or studied by a neuropsychologist as opposed to a craft cultivated with patience and discipline.23 For these many reasons, the more traditional and less extolled rhetorical and mnemonic undercurrents of the studioli have become obscured. 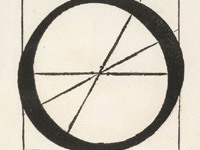 13It is possible to enrich our understanding of the studioli by pursuing a line of inquiry hinted upon by Alberto Pérez-Gómez: "The [studioli] intarsia constituted the stage for a new orbis studiorum, a new definition of knowledge distinct from medieval theology but not distant from its aspirations. "26 How did the studioli redefine the "sphere of knowledge"? What were their classical and medieval precedents, and how are they similar to and different from them? 14The significance of the studioli is multistranded and multilayered: multistranded in that the chambers manifest a complex interweaving of multiple traditions of material and mental craft; multilayered in that individual images could bear multiple meanings, whether alone or as part of an ensemble. It is not fitting to seek a conclusive meaning for any single image: each invites an initial iconographic reading that must expand to consider various autobiographical, pedagogical, theological, and propagandistic contingencies. By delving into the significance(s) of a given image, we begin to discover resonances with other images and to perceive subtle relations that enlace the chambers. 15This investigation dwells on images whose mnemonic associations have not been previously assessed. Some have been analyzed for their iconographic relation to Prudence, a cardinal virtue for which Duke Federico was renowned.27 In the quattrocento, as David Summers has noted, Prudence was considered "a virtue of the practical intellect, the concerns of which were usually thought to be ethical and political. "28 Deeper associations between Prudence and memory, however, have not yet been considered with regard to the studioli imagery. 16Cicero, a humanist role model whose name appears in the Urbino studiolo intarsia as "TVLIO," considered memory integral to the virtue of Prudence. "Memory is the faculty by which the mind recalls what has happened. Intelligence is the faculty by which it ascertains what is. Foresight is the faculty by which it is seen that something is going to occur before it occurs." As the consummation of these three temporal aspects, Cicero defined Prudence as "the knowledge of what is good, what is bad and what is neither good nor bad. "29 Considering Cicero's strong influence at the court of Urbino, this passage offers a promising clue. Other images, too, in the studioli—those related to chess, for example—have received only cursory interpretations; their mnemonic ramifications have also remained unrecognized and will be examined. 17 Fig. 3.5. Detail of the virtues from the Allegory of Good Government. Extended Caption 2There is also a more "hands-on" approach to understanding the studioli. By marveling at the material and intellectual ingenuity expressed in the studioli, we have already begun to apprehend what the studioli are "good for" and, more broadly, to intuit their contribution to "a new orbis studiorum." The visual stimulation experienced in these chambers points to a multisensorial approach to thought in which the training and exercise of the memory was not purely intellectual but an emotional, whole-body experience, integrating the sensible and intelligible. Architecture provided, physically and metaphorically, a model conducive to this integration. Entrance into thought was perceived to be equally physical and mental, opening a channel between the eye of the mind and the corporeal senses. The spatial character of architectural mnemonics—that one would "perambulate" cloisters and palaces in the mind, composing narratives with the ornaments and images arrayed therein—reflects a phenomenological dimension to thought that may be quite foreign to a modern-day observer. 18In Federico's day, the humanist archaeology of classical texts and architectural ruins nourished the imaginations of patrons and architects with examples of public and private spaces by which to "enter into thought." Along with the contemplative eddies in the medieval cathedral,30 intimate domestic settings modeled after the ancient Roman exedra and cubiculum—described by Vitruvius and Pliny and unearthed in the 1470s—provided prosthetic armatures for thought. Their spatial arrangements and ornament prepared a quattrocento mind with visual tropes that literally fed the imagination with materials for cogitation. In the compositions of the studioli we find an amalgam of classical and medieval attitudes toward cognitive architecture. The practice(s) of cogitation, as we shall see, called on physical settings that could move an observer, literally and figuratively. 19In previous scholarship, there has been difficulty in accounting for certain perspectival illusions in the studioli that engage the observer physically and evade categorical assessment. These illusions are not merely sleight of hand-eye coordination or propagandistic demonstrations of patronly magnificentia or technical prowess; fundamentally, they evoke an ambience of wonder ideal for stimulating the mind and, in particular, the memory. As Aristotle notes in his discussion of education in Politics, a favorite of Federico's, "to have the habit of feeling delight (or distress) in things that are like reality is near to having the same disposition toward reality itself. "31 On first reading, we might interpret the realism of the studioli "contents" as an expression of a desire to imitate reality as an achievement unto itself. However, considered in light of architectural mnemonics, the veracity of imagery would have facilitated the rehearsal of appropriate thoughts and habits, like just and prudent leadership, to be enacted in "reality itself." Further distillation of works such as the studioli, then, calls for a mode of inquiry that delves beyond iconographic groundwork to engage their densely layered imagery and the emotional impact of their compositions. A key to the workings of the studioli is offered through a better understanding of the workings of the memory in the quattrocento mind. 20Until well into the Renaissance, the memory was fashioned as a storage place (literally, an ark) for experience and as an engine for its interpretation and reconstitution. "You were trained to furnish the rooms of the mind," Carruthers observes, "because you cannot think if you do not have something to think with. "32 Demonstration of a well-furnished memory, on the battlefield or in matters of diplomacy, conveyed one's capacity for crafting thought. Subsequently, the perception that we make our own thoughts, from any and all available materials, has gradually given way to the more passive notion that thoughts are things we simply have. Fig. 3.6. Collared squirrel, Urbino studiolo. Extended Caption 3 Fig. 3.7. 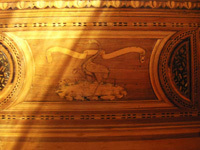 Crane, Gubbio studiolo. 22Healthful symmetry was the objective for politics as well. Themes of reconciliation and universal harmony, such as Alberti's concinnitas and Cusa's coincidentia oppositorum, were counterposed to a litany of crises in faith, politics, and scholarship. The decay of Byzantium brought to Italy an influx of such Greek scholars as Argyropoulos, Cardinal Bessarion, and George of Trebisond (to name only a few), whose direct familiarity with Hippocrates, Plato, Plotinus, Euclid, Ptolemy, and the Corpus hermeticum introduced a fresh set of considerations for Western thought. The meeting of oriental and occidental wisdom problematized (and impregnated) the mind with new possibilities, from meditation and health to accounting, the architecture of time, and the cosmos. 23In Ptolemy's encomium at Urbino, for example, Federico expresses gratitude to the father of astronomy for his precise measurement of the stars and for imposing lines on the earth.34 The rediscovery and rapid dissemination of Ptolemy's works on mapping, accompanied by the flowering of perspective, was closely followed in 1474 by Paolo Toscanelli dal Pozzo's use of a grid of lines to speculate on a westward passage to the Orient. Soon after, this map provided the rhetorical equipment necessary for Columbus to persuade his patrons of the plausibility of such an endeavor. 25 Fig. 3.8. 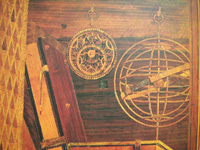 Astrolabe and armillary sphere, Urbino studiolo. Extended Caption 4Misfortune could be cast by the stars or caused by human fickleness. Alliances could shift with the wind, leaving all policies "doubtful." In counterpoint to human frailties and unpredictable fortuna, harmony provided an ethical matrix for contemplation and worldly action. Mediation, prudence, temperance, concord, dissimulation—these ideals for human comportment were believed to bind divine graces to the realm of human affairs. In the face of uncertainty, works of art and architecture embodied enduring lessons in prudence. 27 Fig. 3.9. Exploded axonometric of assembly of an intarsia panel in the Gubbio studiolo. 28Traditionally, memory training centered on enhancing one's ability to respond judiciously to a given circumstance by keeping a prudent eye cast toward the implications of one's actions. The "actual past" existed not as an inert body of facts or "information" to be accurately or inaccurately retrieved but rather as a resource for personal refinement and communal participation. Duke Federico's biographer Vespasiano da Bisticci expresses a common sentiment when he describes the past as the "mirror of the present. "42 By recollecting the lessons of the past, one could more precisely prognosticate the future and calibrate one's actions advantageously in the present. Cultivation of such virtues as Prudence and Temperance offered a causeway to the heavens through their practical guidance in the ethics of earthly matters.43 Amid the extreme political uncertainties of the late quattrocento, an ability to envision the interplay of past, present, and future was acutely significant. Since building memory was perceived as equivalent to building character, for a prince the cultivation of memory was vital in preserving the state, one's family, and oneself. Fig. 3.10. Mirror, Gubbio studiolo. Extended Caption 6 Fig. 3.11. 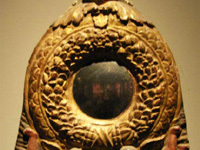 Convex mirror and surround fabricated by the Maiano brothers, 1480. 29The studioli of the Montefeltro may be seen as open manuals for navigating the intricacies of the late Italian quattrocento, providing the duke and his son with treasuries for personal experience, sources of willpower, and templates for action. At Urbino, Federico, his advisers, and his craftsmen fabricated an engine for governance and diplomacy, distilling the influences, qualities, and rewards of a leader recognized for his prudence in the field of action and in the meting of civil justice. In the Gubbio studiolo, we find an engine for a young prince's education,44 an incubator for the duke that Guidobaldo was, it was hoped, to become.